This description of the First of the Epistles of Peter is from Easton's Bible Dictionary. 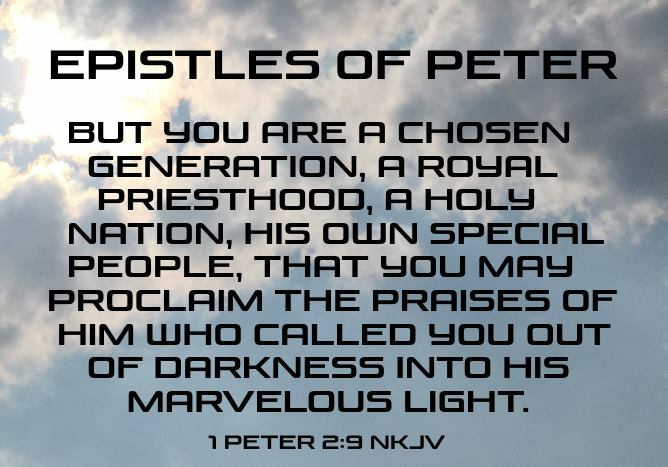 Peter, First Epistle of: This epistle is addressed to "the strangers scattered abroad", i.e., to the Jews of the Dispersion (the Diaspora). concludes with counsels to pastors and people (1 Peter 5:1-14). This description of the Second of the Epistles of Peter is from Easton's Bible Dictionary. Peter, Second Epistle of: The question of the authenticity of this epistle has been much discussed, but the weight of evidence is wholly in favour of its claim to be the production of the apostle whose name it bears. It appears to have been written shortly before the apostle's death (2 Peter 1:14). This epistle contains eleven references to the Old Testament. It also contains (2 Peter 3:15,16) a remarkable reference to Paul's epistles. Some think this reference is to 1 Thessalonians 4:13-5:11. A few years ago, among other documents, a parchment fragment, called the "Gospel of Peter," was discovered in a Christian tomb at Akhmim in Upper Egypt. Origen (obiit A.D. 254), Eusebius (obiit 340), and Jerome (obiit 420) refer to such a work, and hence it has been concluded that it was probably written about the middle of the second century. It professes to give a history of our Lord's resurrection and ascension. While differing in not a few particulars from the canonical Gospels, the writer shows plainly that he was acquainted both with the synoptics and with the Gospel of John. Though apocryphal, it is of considerable value as showing that the main facts of the history of our Lord were then widely known.